The Marine Railway. Frederick Douglass-Isaac Myers Maritime Park—. 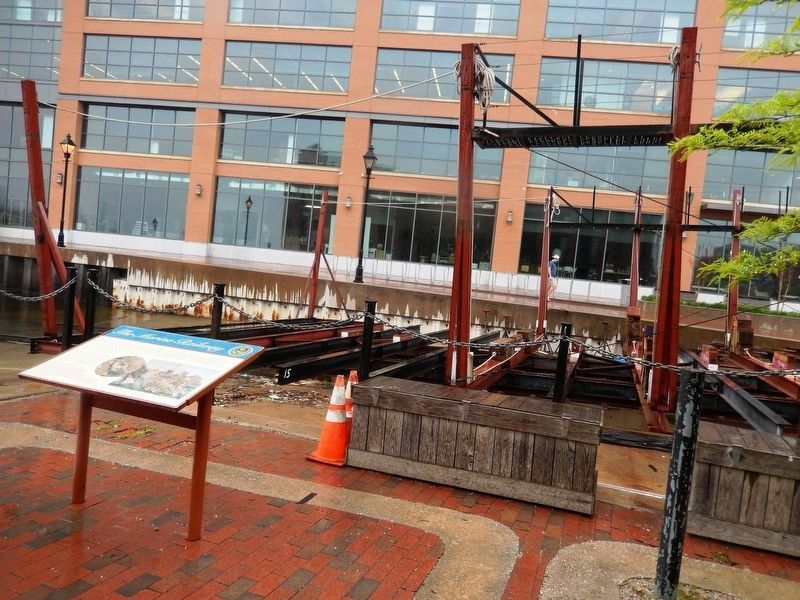 During the early 1800s, shipyards dotted Baltimore’s Harbor. Many of them drew vessels in need of repair from waters up and down the Atlantic coast. Repairs ranged from minor sail mendings to complicated restorative hull work rendered by skilled shipwrights and carpenters. Marine railways pulled and lifted boats out of the water so that they could be repaired. Vessels were floated into a carriage or cradle and then pulled up the rails out of the water by horses, mules, or oxen. Shipyard workers often lent their hands and body strength as they guided heavy watercraft from the harbor. 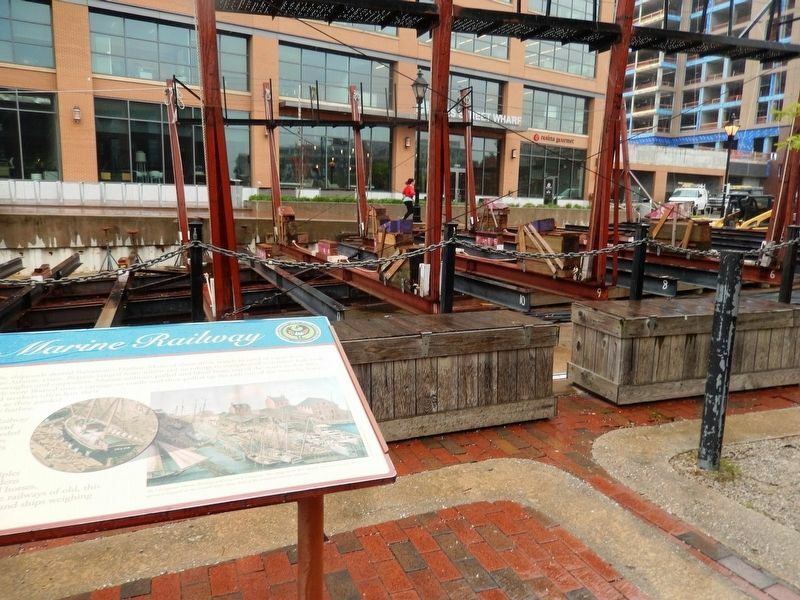 The Chesapeake Marine Railway and Dry Dock Company had so much business that it needed two marine railways. Workers kept the railways occupied six days a week, 52 weeks a year. The marine railway here was built following the same principles as historic railways. In this modern rendition, motors have replaced horses, mules and oxen. Like the marine railways of old, this mechanical device can lift boars and ships weighing up to 100 tons. 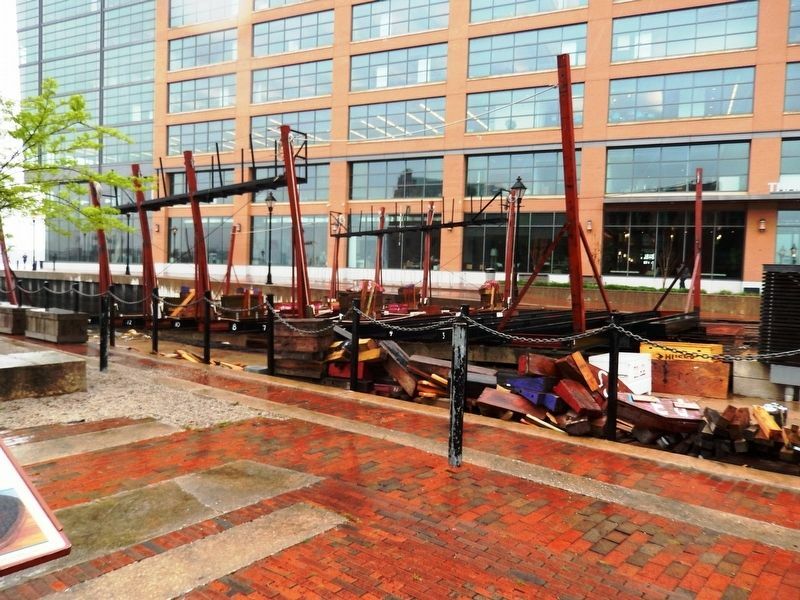 During the early 1800s, shipyards dotted Baltimore’s Harbor. Many of them drew vessels in need of repair from waters up and down the Atlantic coast. Repairs ranged from minor sail mendings to complicated restorative hull work rendered by skilled shipwrights and carpenters. Marine railways pulled and lifted boats out of the water so that they could be repaired. Vessels were floated into a carriage or cradle and then pulled up the rails out of the water by horses, mules, or oxen. Shipyard workers often lent their hands and body strength as they guided heavy watercraft from the harbor. Location. 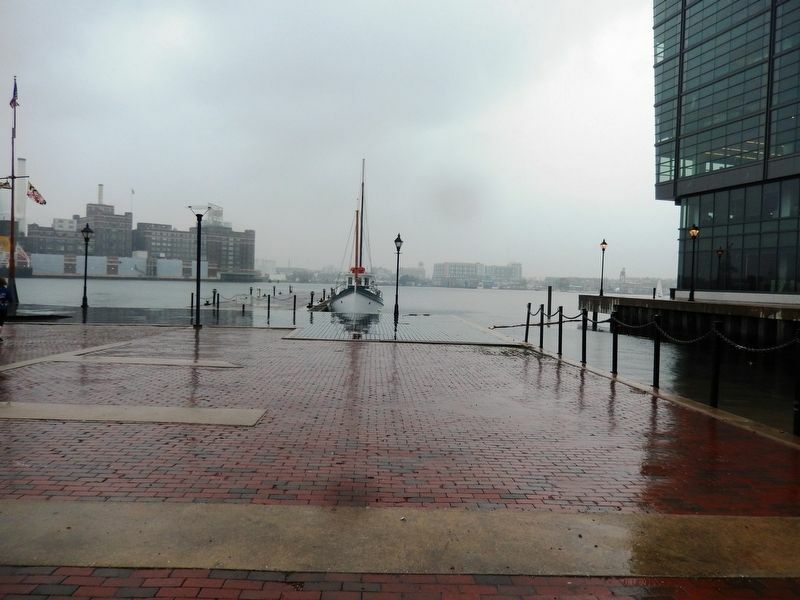 39° 16.762′ N, 76° 35.782′ W. Marker is in Baltimore, Maryland. Marker is on Thames Street. Touch for map. The marker is located on Chase's Wharf in Fells Point. 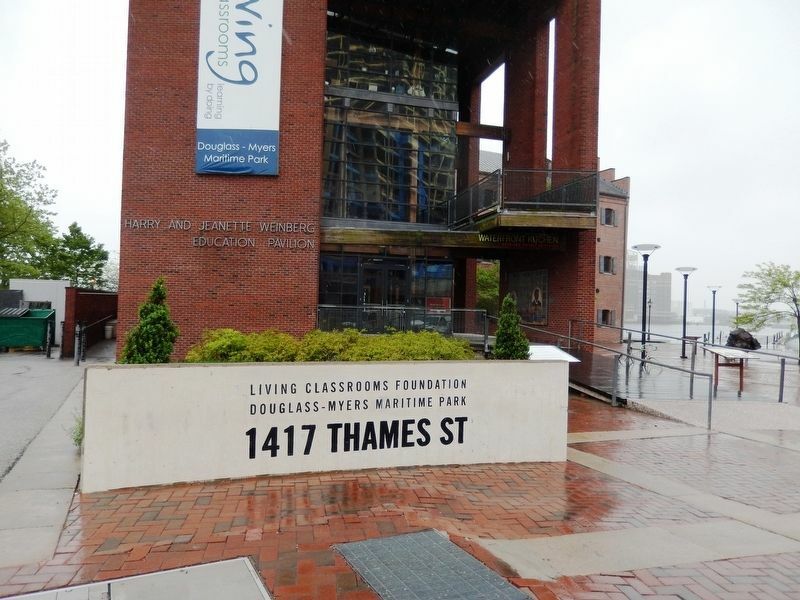 Marker is at or near this postal address: 1417 Thames Street, Baltimore MD 21231, United States of America. Touch for directions. Other nearby markers. At least 8 other markers are within walking distance of this marker. Frederick Douglass Sculpture (a few steps from this marker); Archaeological Remains (within shouting distance of this marker); Frederick Douglass-Isaac Myers Maritime Park and Museum (within shouting distance of this marker); The Hankin Healthy Harbor Walking Tour (about 400 feet away, measured in a direct line); The Black Shipbuilders of the Chesapeake Bay (about 600 feet away); Association of Maryland Pilots (about 800 feet away); Loring Cornish / How Great Thou Art (approx. 0.2 miles away); Record Store Day (approx. 0.2 miles away). Touch for a list and map of all markers in Baltimore. More. 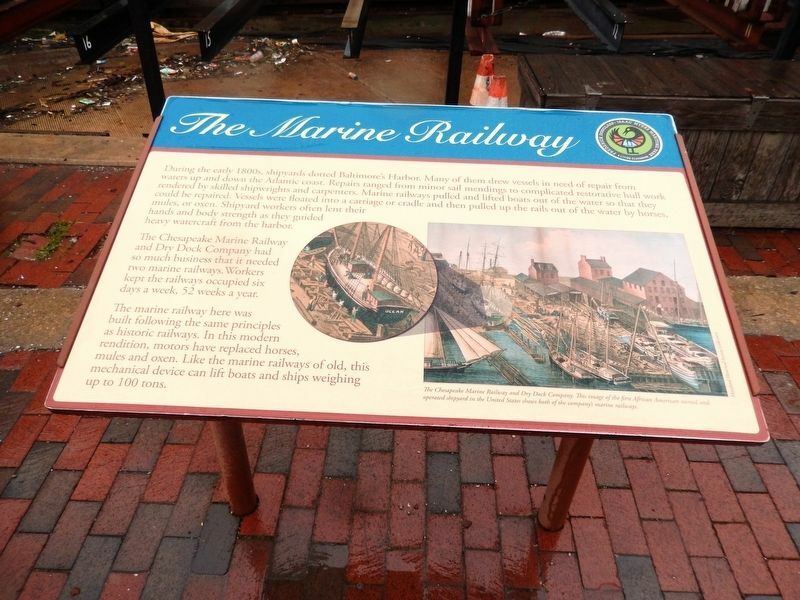 Search the internet for The Marine Railway. Credits. This page was last revised on May 15, 2017. This page originally submitted on May 13, 2017, by Don Morfe of Baltimore, Maryland. This page has been viewed 111 times since then and 8 times this year. Photos: 1, 2, 3, 4, 5, 6. submitted on May 13, 2017, by Don Morfe of Baltimore, Maryland. • Bill Pfingsten was the editor who published this page.